Background: Dr. Elizabeth Hendon Stokes was a long-time supporter of school psychology in Tennessee. She was involved in the planning of the organization and served as president of the formerly named Tennessee Association for Psychology in the Schools (TAPS) in 1978-1979. She held many positions in her distinguished career including those of social worker, school psychologist, and director of guidance. However, in her position as Professor of Psychology and Director of Testing at Austin Peay State University (APSU) she was highly instrumental in the development of that institution's school psychology program. She was known to her students and colleagues as one who embodied the concept of best practices. When Dr. Stokes retired from APSU in 1987, TASP decided to honor her exemplary service by establishing the Elizabeth Stokes School Psychologist of the Year Award. Following Beth Stokes’ death, in 2004, the Board renamed the award, “The Beth Stokes Memorial Award: Honoring Best Practices" in February 2005. Purpose: To identify and recognize an outstanding school psychologist and to increase public awareness of the profession. The recipient of this award will also be Tennessee's nominee for the NASP School Psychologist of the Year Award. Who Can Nominate: Nominations can be made by anyone who knows the nominee and his/her level of professionalism. Who is Eligible: Practicing school psychologists who spend the majority of their time providing direct services to students, teachers and parents in school settings and who are current members of TASP. Trainers, researchers, or administrators are not eligible for this award. The NCSP and NASP membership are desired, but not required. Selection and Notification: The award chair will provide copies of all nomination materials to the TASP board members prior to the board meeting at which a final winner will be selected. The TASP board members will review materials, validate entries, and select a winner at the designated board meeting. All candidates will be informed of the outcome. The winner will be responsible for turning in the necessary materials to NASP for consideration as Tennessee's nominee for the School Psychologist of the Year Award. The candidate will be recognized during the awards ceremony at the Fall TASP or Mid-South convention and will be awarded a plaque/certificate, paid membership for the subsequent year, paid registration for the conference at which the award is presented, and a $100 cash award. 1. Provides school psychological services in line with current TASP/NASP practice standards. 1. Nomination materials must be typed. b. Nomination Statement: In one page, describe why the candidate should be considered for this award. Give specific examples in the following areas: data-based decision making; consultation and collaboration; student diversity; development of cognitive, academic, social and life skills; knowledge of schools and systems; prevention, crisis prevention and mental health; home/school and community collaboration; performs job in an exemplary manner; earns respect of others; has professional memberships and leadership. d. Letters of Support: These should be one page letters written by individuals knowledgeable about the candidate’s capabilities (e.g., teachers, parents, students, colleagues, administrators, etc.). At least one letter must be from an individual in the candidate's school system. No more than 5 letters of support should be included. The 2018 winner of the Beth Stokes Best Practices Memorial Award is Dr. Katherine Price from Metro Nashville Public Schools. As described by several of her colleagues, including fellow school psychologists and coworkers in other professional positions, Dr. Price is student-focused, highly ethical, and demonstrates best practices in serving her schools and their families. She has been an advocate for and key player in the implementation of Multi-Tiered Systems of Support at the elementary school she serves. This school has a high-needs, high-poverty population of students and Dr. Price has faced the challenges inherent in this type of population with tireless care to ensure they have access to needed interventions and resources. Due in large part to Dr. Price’s efforts, this school was awarded Bronze Level Model Status by the TN Department of Education for their Response to Intervention – Behavior model. In addition to her practices within her schools, Dr. Price is a leader among her school psychologist colleagues. She is the co-chair of the MTSS Professional Learning Community. She has presented trainings to the department on the implementation of MTSS, FBAs, BIPs, early childhood and Autism evaluations. 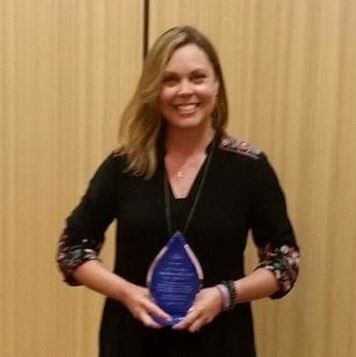 Upon receiving The Beth Stokes Best Practices Memorial Award, it could be said that Dr. Price has won the triple crown of school psychology in TN as she was also the recipient of the TASP William Ballard Award for outstanding graduate student in 2009 and the Director’s Award in the school psychology program at The University of Memphis in 2011. Cindy Minnis, EdS, NCSP, is currently one of the Lead School Psychologists in the Metro Nashville Public Schools. She has served in the Nashville Schools since her internship in 1997. Cindy is highly regarded by peers and supervisors as a compassionate, child-centered psychologist who has served in a variety of roles throughout her career. She serves on the district’s Threat Assessment Team, providing training in the policies and procedures, as well as conducting threat assessments across the district. Because of her passion for the social and emotional well-being of students throughout the Nashville community, Cindy also works closely with the Student Support Services department. She serves as a member of the district’s “Aligning Social Emotional Learning Initiatives” planning team. She serves on the district’s PASSAGES committee, which addresses disproportionality, and she serves on the leadership team of Social Emotional Learning Facilitators, to name a few.